Last week, I watched this 1986 17-minute documentary directed by John Heyn and Jeff Krulik. Apparently it’s a bit of a cult classic that had totally passed me by for all these years. 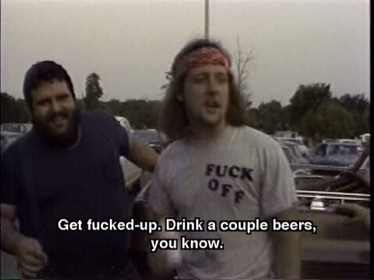 Heavy Metal Parking Lot documents heavy metal music fans tailgating in the parking lot outside the Capital Centre (which was demolished in December 2002) in Landover, Maryland, on May 31, 1986, before a Judas Priest concert during their Fuel for Life tour (with opening act Dokken). 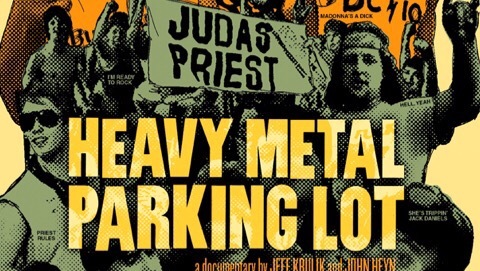 By the early 1990s, Heavy Metal Parking Lot had become an underground cult-classic, usually traded on bootleg VHS videotapes. It was reportedly a favorite on the Nirvana tour bus, among many other bands. Due to growing popular demand for the film, music-rights issues were finally sorted out with Judas Priest. Yeah, this was a fun watch and certainly not something that’ll waste your time at only 17 minutes. Only those who lived through this era will really appreciate the very low budget interviews with a bunch of drunk metalheads, though. There were several guys I went to school with who were exactly like these dudes (not the girls so much). I wasn’t really part of a group in school as I was more of a loner but I got along with the jocks, etc, just as well as with the metalheads. But I preferred the metalheads. I never really explored Judas Priest beyond the biggest hits but I did like the songs I knew (I was more of a Metallica & Anthrax girl). 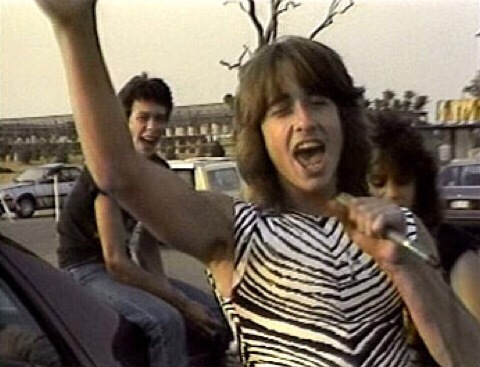 The best thing about this documentary is the guy in the below photo, who they later named “Zebra-Man”. Because there’s a follow-up “Where Are They Now” thing in which they track him down & interview him (you can watch that HERE. but, of course, watch the film first). Two even shorter follow-ups, Monster Truck Parking Lot & Neil Diamond Parking Lot, are also available on YouTube. They’re okay but a bit pointless – stick with the original! I always love checking out the documentaries on the old school metal and rock bands, it is truly amazing to see how the times have changed, and how they paved the way for so many things today. Awesome! I watched this several years ago – some parts were cringe worthy because I could have easily been on of the drunken fools yelling at the top of my lungs in the film. I didn’t know about the follow up but will definitely want to see that. 🙂 It was good to see JP decide to let the film use/keep the music, name and images. Yeah, I listen to Sinatra and Dean Martin now, lol! I still rock out once in a while but not as much as I used to. I feel like I might actually enjoy this. I do love that era of music. Although I am not a particularly big Judas Priest fan per say.